More housing stories are in the news. When you arrive at Kowloon Station and ascend the escalator to Elements mall, there's an army of property agents shoving brochures in your face, asking if you want to buy a flat. No, I just want to have some dinner. The brochures are for a residential project called Cullinan West in nearby Nam Cheong station, and they average over HK$20,000 per square foot. But that rate didn't deter a family today, where three members bought three four-bedroom flats each, with the total bill totaling a whopping HK$200 million. There is no further information on who these buyers were or how big the flats were, but who happens to have HK$200 million to spend like that? And were they all first-time buyers so they avoided paying the extra stamp duty too? Then there is the other extreme -- subdivided flats, not in seedy Sham Shui Po, but in the tony neighbourhood of Mid-Levels. Reporters posed as potential renters ad visited a 2,400 square foot flat on Old Peak Road that was subdivided into five units, ranging from 250 sq ft to 656 sq ft, and rents from HK$25,000 to HK$36,000 respectively. 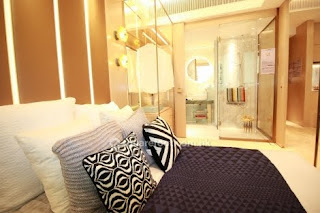 Who pays HK$25,000 for 250 sq ft to rent? Apparently the hefty price includes utility bills, and a maid coming in to clean up twice a week, bed sheets changed once a week and free wifi. There's also basic open kitchens with an induction stove top, kettle and coffee maker. So now we have people hoarding flats with hundreds of millions of dollars on hand, and at the other end of the scale, expensive flats subdivided into smaller ones and charging exorbitant rents. And the Hong Kong government says it's watching the situation closely and can intervene at any time? When will HK Micro Flats Stop?